We’ve all had the uncomfortable experience of getting smoke blown into our eyes. But as it turns out, our eyes don’t need to feel the burn that our logs do. Have you heard of smokeless fire? It sounds like something magical, perhaps because smokeless fires first appear in Arabian and Islamic mythology as the way in which jinn are created. It doesn’t take a jinni to know that making a fire that doesn’t produce smoke is easy to do and offers many benefits. It is not only a practical survival skill, but it has plenty of environmental and health benefits. In this article, we’ll break down the elements of a fire and give you an understanding of what chemically creates smoke to begin with. Then we’ll go over the health hazards of smoke and five different ways to build a smokeless fire. 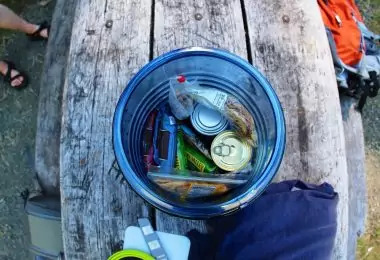 All of these smokeless fire tips are meant to help you be successful, healthy and sustainable in the wilderness. To understand how smoke is created. We’ve got to understand the mechanics of fire. When oxygen interacts with a fuel at a high temperature, fire is created. Smoke forms when there isn’t enough oxygen to burn the fuel. When we use paper or wood as fuel, smoke occurs because these materials also contain water, carbon, ash, and other organic compounds. The hydrocarbons in the wood vaporize at high temperatures cause smoke. The solution is to use better fuel, fuel that’s not wet or contains only carbon. Examples include: charcoal or dry wood. A complete combustion, like what we’re going for with smokeless fires, produces water and carbon dioxide. An incomplete combustion results in hydrogen, carbon, and oxygen being produced. These compounds form a gas, which we refer to as smoke as well as producing char and ash. Why Make a Smokeless Fire? Smoke isn’t always a bad or inconvenient thing, especially when you’re smoking meats. But unless you’re doing that, smoke is a huge waste of energy and fuel as well as a health hazard if you are exposed to it for a prolonged period of time. We’ll go into four reasons why it is worth making a smokeless fire next. The smell and light of a fire, and the appearance of smoke, are all dead giveaways to your location. Now, hopefully, you’re not in that dire of a survival situation but if zombies are on your tail or if there’s someone more realistic and sinister, it is a good idea to know how to keep a fire concealed and your location hidden. A smokeless fire might be a necessary safety measure you take in the wild. Enjoy the wilderness responsibly. Don’t further contaminate our planet with careless fire starting just because going smokeless requires a bit more thought and preparation. A smokeless fire helps to reduce air pollution and your personal carbon footprint so the woods we all love so much has more of a chance of thriving for generations to come. Is also a bad idea. These chemicals also have adverse health effects on the human body. Smoke contains toxins that can cause major damage if breathed in, especially after a long period of time but these added chemicals are just as bad. For tips on how to start a robust campfire, see our article on this topic for more information. Smokeless fires take less time to get going and they burn longer, which are both great assets when cooking. Since all of the fuel is being used to produce the heat you need, your flames will be hotter and your food will cook faster. You won’t have to keep adding fuel which will elongate the cook time as well. With a smokeless fire, cooking meats in bulk is easy, fast, and you won’t be wasting fuel. Anthracite – A hard coal of about 91% carbon that produces no smoke and a blue flame. Coke – Derived from coal through a process called destructive distillation. It’s about 90% carbon. We’re going to outline five ways to make a smokeless fire next. Each one has a specific method for building the fire and a set purpose ranging from survival to indoor comfort. Whether you want to use charcoal or take a lesson from our Native ancestors, there are five great ways to build a smokeless fire. You can use charcoal, a more stealthy and survival oriented method, an upside down fire, the Dakota fire hole, or you can purchase an indoor modern option. First off, let’s talk about charcoal. What is it exactly? Charcoal is created by burning wood at high temperatures without oxygen, it’s pure carbon. Charcoal offers a lot of heat and no smoke, making it an easy way to have a smokeless because coal is easily bought. Set up your bricks in an arrangement that will trap as much heat as possible. Use 2 or three blocks to make stove, there should be enough space between them for your fuel to sit. Take a sheet of newspaper and put it in the center of the bricks. Take three pieces of tinder and arrange them in a triangle on top of and in the middle of your newspaper. Place another three pieces of tinder on top of the three you’ve already placed to make a star shape. Continue this pattern until it has increased in height and is steady. Place two or three pieces of fire starter in the middle of the tinder nest to light it. Add some charcoal and watch your fire grow. Slowly add more fuel over time. The bricks will help to keep a lot of the heat so you can stay warm and toasty. You’re going to want to create this campfire in the reverse order than you are probably used to. For the first few minutes, it might smoke like a regular fire, but shortly thereafter the fire will burn brightly and without smoke. Place the big logs as the base of what will be your campfire. From there, add smaller logs and kindling. Crumple the paper at the top of this stack, right above the kindling. Light the paper and watch the kindling catch and the fire spread down to the larger logs. This method is great if you are trying to be stealthy and you are not carrying around a lot of extra resources, like coal. Collect the smallest and driest twigs you can find, not bigger than the diameter of a pencil. Tip: Twigs found on the ground will be drier than those still on trees and they will burn the quickest. After collecting a good amount of twigs, break apart and pile these smaller pieces. Place the broken-up twigs on a shred of grass, paper, or dry leaves. Ignite the tinder. There will be some smoke at first, but as the fire gains strength and reaches its maximum efficiency, it will dissipate. This will take about a minute. Feed the fire slowly, only adding a few twigs at a time. Feeding the fire too much too fast, will result in smoke. It’s easy enough to extinguish a smokeless fire with a handful of water or dirt. You can also use a backdrop to enhance these three methods. The backdrop is a large rock and some smaller ones arranged so that the smoke is prevented from spreading and it forced upward. Dig a shallow hole in the ground. Prop the larger rock on one side of the hole. Use the smaller ones to line each side of the large rock, forming a semi-circle. Place your ignition source at the center and slowly add kindling and fuel. If you want a fire that’s not only smokeless but the flame is also concealed, you’ll want to consider the Dakota Fire Hole Method. Making this fire pit requires you to dig a hole that’s deep enough to conceal the fire, while also digging a separate shaft that ventilates the fire. If done successfully, this fire will burn hotter than an ordinary fire while also enabling you to remain stealthy and undetectable. This method works so well because all of the heat that the fire generates goes upwards and more air is pulled in through the duct. The flames are continually being fanned enabling the fire to continue to burn as long as you like. Native Americans pioneered this method for smokeless fires so they could hide their cooking fires from enemies, but it’s also a great way to guard against windy conditions, consume less wood, and create a stable space for cooking. Tip – Avoid digging in areas that are rocky, have hard ground, are surrounded by trees and roots, are near water, or ground that is too soft to hold the hole’s shape. First, dig the fire chamber. It should have a 1ft diameter and be 1ft deep. When you are done with that, widen the base of the chamber so the hole has more of a jug shape. This this widened shape, you’ll be able to burn larger pieces of wood. About a foot away from the edge of the fire chamber, dig the air tunnel. Make sure you are on the upwind side. Carve out a tunnel about 6in in diameter and have it angling down towards the base of the fire chamber. Build your fire in the fire hole and place a grate of green saplings to hold your pot over the flames. When you are done, don’t forget to respect the environment and practice Leave No Trace ethics. Shovel the dirt you dug up back into the hole and plug the vegetation back into the hole if possible. Nowadays, there’s a market for in-home smokeless fireplaces. Almost all models come with an electrically activated chimney that also features a fan. The fan drains the smoke from the immediately and effectively. There are four common types in-home smokeless fireplaces. These types of smokeless fireplaces are the most energy efficient and use state of the art technology to promote your smokeless fireplace. They’re also designed to have a simple and streamlined appearance. This type of smokeless fireplace uses waves to keep the fire fueled and it turns on by sliding an insert into the opening. Having a smokeless fire at home has never been easier! Tabletop smokeless fireplaces come in a variety of sizes making them easy to move from one room to the next. They’re targeted to an eco-friendly focused audience and those who live in smaller spaces, like city apartments. It’s always an option to renovate your current fireplace with things like folding glass doors or remodeling the edge of the fireplace opening. Chimneys are a great place to start too. A chimney should be cleaned an inspected one a year. Get it checked in early spring, before soot deposits have hardened. Lengthen your chimney by adding a masonry cap to the chimney’s top. By doing this you are lengthening the chimney and changing the air flow over the flue opening. Try arranging the logs on andirons or on a raised grate set far back into the fireplace. Raising the logs lets the air get underneath which helps with combustion. Raising the logs also raises the flames, preventing smoke to waft forward before upward. Place a large log at the back of the fireplace and a medium sized one at the front. In the space between, add kindling. Put another medium sized log on top of that. Avoid crumpled newspapers because they can produce large cinders. Light the fire from below and at both ends. Push the front log toward the back and put a new log in its place when it needs replacing. Use the damper. The damper is a hinged, metal plate at the base of the chimney and it controls the air passing up the flue. You can find the lever to the dampers by reaching up into the fireplace. Make sure the damper lever is pushed as far as possible forward, this means it’s open and you can now light a fire. To reduce the fire, you can adjust the damper and close it a little. Keep a window open, only about two inches to keep the air flow in the room circulating. Before starting a fire, always inspect the area to ensure you are building a fire in a safe space and fire permitted space. Keep at least ten feet of the area around your fire clear of flammable materials, especially your gear. Always keep a source of extinguishment nearby, like a bottle of water or pile of dirt. Gather all of your materials before starting a fire. The presence of any water will cause smoke. Make sure your fuel is kept as dry as possible. If you have a home, create a shed for your firewood. Before building a fire, you should also check your fuel for ash, as it also produces smoke. Dried animal droppings, dry grass, and wood stripped of bark. All fuel used should be no bigger than 2ft and no smaller than your thumb. Potato chips, cotton balls and petroleum jelly, leaves, twigs, paper. Do read our piece on how to start a fire with sticks to give you more options. Traditional fire building is falling out of fashion with mounting environmental and health concerns. But if that’s not reason enough, the stealth aspect of a smokeless fire is pretty cool too for those who are into survival. We’ve talked about what makes a fire smoke, the chemicals and compounds released, the best tinder and fuel to work with, and alternative building methods rooted in Native wisdom to modern convention. Now, it’s up to you. Check our our tips and guidelines on campfire safety to stay safe outdoors. Do you have a favorite way to go smokeless with your fire? Why do you think it’s important to have a smokeless fire?